Pat Lee (born February 20, 1984 in Miami, Florida) is an American football cornerback for the Green Bay Packers of the National Football League. • Played in five games as dime back and special teamer in 2008 before knee injury ended rookie season. • Earned second-team All-SEC recognition from The Associated Press in 2007, when he posted a team-high 12 passes defensed, including four interceptions, which was tied for the team lead. • Played against fellow second-round pick WR Jordy Nelson in 2007 season opener vs. Kansas State, a game the Tigers won, 23-13. 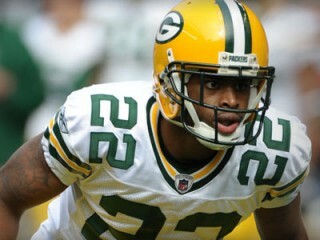 • Became highest Packers draftee from Auburn since RB Brent Fullwood (fourth overall) in 1987. Promising, physical young cornerback who will look to compete again for nickel and dime jobs after battling knee injuries for most of his first two seasons... Sustained a knee injury in the ’09 preseason finale and spent his entire second season on injured reserve... Drafted in the second round (60th overall) in 2008, played in five games as a rookie, posting one tackle, one pass break-up, and two special teams tackles before a knee injury ended his season... Known for playing press coverage coming out of Auburn, is a potential starter in the future as he learns behind veterans Al Harris and Charles Woodson... Played both cornerback spots in college, becoming a full-time starter as a senior after playing primarily in nickel and dime packages during his first three seasons... Played in 49 games with 22 starts during his career, and recorded 103 tackles, 23 passes defensed and five interceptions, including a team-best 12 pass break-ups and career-high four interceptions as a senior, when he earned second-team All-SEC honors from The Associated Press and Rivals.com... Was a safety in high school before converting to cornerback in college. 2009 : Sidelined for first three preseason games due to a back injury sustained in Aug. 6 training camp practice... Returned to the field for preseason finale at Tennessee (Sept. 3), but injured his knee on his 41-yard kickoff return in the third quarter, and was placed on injured reserve Sept. 5. 2008: Played in five games and posted one tackle, one pass defensed and two special teams tackles...Was inactive Weeks 1-3 and 9-11... Injured in Week 12, was inactive the following week and placed on injured reserve Dec. 5... At Tampa Bay (Sept. 28): Played in first NFL game, seeing action on special teams and for a handful of snaps at dime back... Vs. Atlanta (Oct. 5): Saw most extensive action of season as dime back. Broke up a Matt Ryan pass intended for WR Roddy White in the second quarter. Finished with one tackle and also tied for team lead with two special teams tackles... At New Orleans (Nov. 24): Played on special teams but sustained season-ending knee injury in second half... 2008 Draft: Selected by the Packers in the second round (60th overall), the third of the team’s three picks in the second round and the 10th DB selected overall. Became Green Bay’s second-highest pick ever from Auburn behind RB Brent Fullwood (fourth overall in 1987) and the first player selected from the school since LB James Willis (fifth round) in 1993. Became a full-time starter as a senior with the Tigers after playing primarily in nickel and dime packages during his first three seasons... Played in 49 games with 22 starts during his career, and recorded 103 tackles, 23 passes defensed, including five INTs, and added two forced fumbles and a fumble recovery... Posted at least one tackle in the final 20 games of his collegiate career... Played the vast majority of snaps in press man coverage and saw time at both CB spots during his career... Also had 12 kick returns for 299 yards (24.9 avg.)... Played in a bowl game in each of his four seasons with the Tigers, with Auburn coming out victorious in three of the contests... Also played in 2008 Senior Bowl for the South team... Majored in criminology... Senior season (2007): Started all 13 games, earning second-team All-SEC honors from The Associated Press and Rivals.com as he led the team in passes defensed (12) and tied for the team lead with a career-high four INTs... Ranked sixth on the team with 55 tackles, registering at least three tackles in 11 of 13 games... Returned 11 kickoffs for 284 yards (25.8 avg.)... Recorded six tackles, including one for loss, along with two passes defensed and a forced fumble in season-opening win vs. Kansas State (Sept. 1), a game in which he faced off against fellow Packers second-round pick WR Jordy Nelson... Picked off Heisman Trophy winner Tim Tebow at Florida (Sept. 29)... Posted an INT in back-to-back contests, at LSU (Oct. 20) and vs. Ole Miss (Oct. 27), to become the first Tigers player since 2004 to post an INT in consecutive games... Also registered a career-high eight tackles against the Rebels... Was a preseason third-team All-SEC selection and also was named Most Improved Linebacker/Defensive Back of the spring by Auburn’s coaches heading into the ’07 season. Born Patrick Christopher Lee in Miami, Fla.
High school: Earned SuperPrep All-Dixie honors and Florida Times-Union Super 75 recognition as a senior at Christopher Columbus H.S. in Miami, Fla. ... Named one of the top five CBs in the state by the Times-Union... Also earned second-team All-Dade County honors... Started two seasons at safety... Finished senior season with 70 tackles, three INTs, five passes defensed, two fumble recoveries and two blocked kicks... Returned one INT 75 yards for a TD and also returned 14 kickoffs for 256 yards, including an 85-yard TD return... Played S, CB, RB and WR during his career... Also competed in track and won the state title in the long jump with a leap of 23 feet, 10 inches... Earned three letters in basketball... Community involvement: Participated in events to benefit the Al Harris Outreach Program and the Donald Driver Foundation... Participated in the Edgar Bennett Celebrity Bowl-A-Thon to benefit Families of Children with Cancer... Served as a mentor while in college to a young man named Jamon, 11, as part of a program called “Project Uplift,” similar to Big Brothers Big Sisters. As Hobbies/interests: Interested in becoming a U.S. Marshal following his playing days, and also has an interest in the real estate business... Attended a business networking retreat for professional athlete this past offseason in Cancun, Mexico... Enjoys fishing in Miami... Names The Coldest Winter Ever as his favorite book and The Pursuit of Happyness as his favorite movie... Lists Deion Sanders as his favorite athlete... An avid hip-hop listener, names Gucci Mane, Jay-Z and Lil Wayne as his favorite artists.